Lena Machado is without a doubt one of the most prolific and influential composers in the history of Hawaiian music whose songs are still well loved and often performed and recorded by today’s Hawaiian music artists. She was also a performer with an ethereal voice which earned her the nickname “Hawai`i’s Songbird.” Armed with her composing and performing talents, Auntie Lena became one of the first local Hawai`i musicians to tour internationally – an unofficial ambassador of good will and aloha. She this until the very end of her career – all while loving a husband as deeply as humanly possible (as chronicled in her many compositions), raising a family, and being a fervent advocate for women’s rights. When examining Auntie Lena’s career – just as with Alvin Kaleolani Isaacs, Irmgard Aluli, John Kamealoha Almeida, and a scant few others – we have to examine two aspects of her musical career – the performer and the composer. 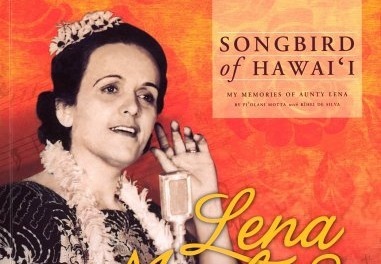 The composer has been well chronicled by Lena’s hānai daughter Pi`olani Motta in the book Hawai`i’s Songbird (an essential read for any fan of Hawaiian music or Lena Machado). But except for one compilation CD which only covers two brief periods in her lengthy recording career, there is no other material chronicling Lena Machado the performer and recording artist. Ho`olohe Hou Radio corrected this injustice for a full week last fall – in honor of Lena’s October 16th birthday – during which we offered up rare recordings from the whole of Lena’s performing and recording career – all of them, in fact (except for two which have proven most elusive), in chronological order starting with her very first recording session in 1927 and concluding with her final sessions in 1962. Until Auntie Lena’s birthday rolls around again, these segments from Ho`olohe Hou Radio have been transcribed as text complete with audio clips to illustrate her composing and singing style. Click on the links below to read about the various phases of Lena Machado’s life and career while enjoying some of the rarest selections from the Ho`olohe Hou Radio archives.